Teatro place within the walls of the city is dated around the middle of the third century BC, is located east of the Acropolis, partially encased in the rock and is believed capable of eight thousand spectators. The auditorium, hemispherical, has its sides extended by about three meters, has a diameter of ml. 64,51, and is divided by six stairs in 7 sectors. In 1927 in the auditorium they were found in a cave prehistoric age. The temple is without doubt the best known of the monuments, because of its own beauty, but also the natural setting in which it is inserted, agaves, brooms, which is fifth from the Forest of Pispisa. 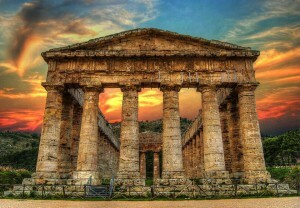 It seems it was built in the fifth century BC on the request for help from the front part of Segesta in Athens and Carthage, some argue that this is a work unfinished, and others who claim that such peristyle for some worship outdoors, by the Greek population of Segesta. Temple and theater are the most famous monuments, but not the only, time in other major and no less important remains have come to light, such as the so-called Sanctuary of Contrada Mango. More recently a major boost to the excavations came by the Superintendence of Trapani incollaboration with universities, which using sophisticated techniques of aerial photography have led to the discovery near the Theatre of buildings dating Arabic-Byzantine, including a castle and a Mosque, the various surrounding walls, the City Gates and the road system. Meanwhile, the project has taken shape of the archaeological park, which among other things has allowed the restoration of some existing buildings within the park.